St Croix Ultimate Bluewater Adventures has been called 'the friendliest dive shop on earth' and offers a fantastic opportunity to anyone who wishes to become a fully-certified diver while on holiday in the Virgin Islands. 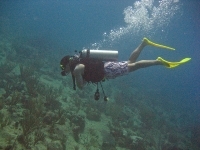 While experienced divers will find their every need catered for (try the night dives! ), the real beauty of the operation is the ease with which complete novices can obtain their PADI Open Water Diver certification, under the expert guidance of highly-qualified dive staff. Over and above experiencing the beautiful underwater sights of the Caribbean, doing a diving course in the US Virgin Islands allows visitors to the islands to leave with a skill that they'll cherish for the rest of their lives.